Francis (Francie) Cassidy was born in Auglem in 1869. He came to Boston as a young man and worked his way up to responsible position in a Boston hotel. 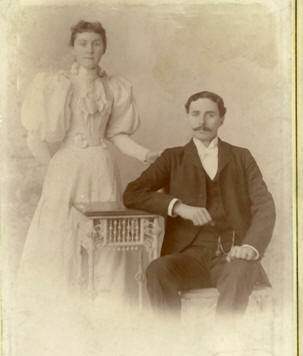 Julia Brennan was born in Clare Morris in County Mayo in 1876; she came to America at the age of seven and was raised by her sisters in Watertown. By all accounts she was an exemplary woman. In 1905 Francie decided to take the family to Auglem to live in a small farm near his parent’s home. At the time, he was thirty-six and Julia was twenty-nine and they had three children ( Marion, Frank and John. Joseph, Agnes Julia, Alphonses, Eileen, Donald and Ita were born there in their tiny cottage. Agnes Julia died in 1914 at the age of 7 and is buried at Clar. In 1914 World War I broke out and in 1916 the IRA staged the Easter Rebellion; in 1919 the “Troubles” began. In response to Irish Army military actions, the British government unleashed the Black and Tans, an army of terrorists from British prisons, to torture the Irish people. Young Frank returned to Boston in 1915 and may have served in the U.S. Army in France. The family returned to Boston in May 1921. In June the “Troubles” ended in Ireland. Eventually, the Cassidys achieved prosperity in Boston, and Ireland became a free country.